Welcome to Sharmalyn, a Family holiday home in Harlyn Bay Nr Padstow, sleeping up to eight people. **** Star comfort with beautiful sea views, private garden and ample parking. This self–catering accommodation in Cornwall comprises of two double bedrooms with ensuite facilities; and one twin single bedroom and one room with bunk beds, each with its own washbasin. In addition there are three separate WCs, one with a shower. 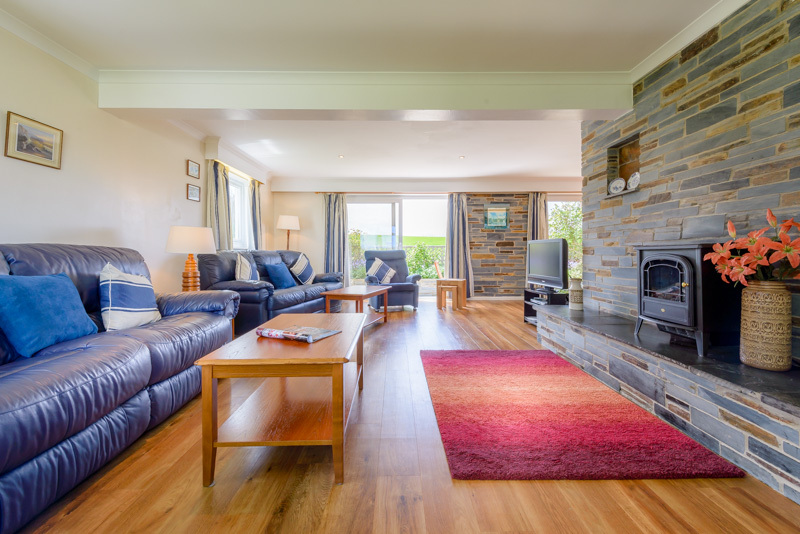 The holiday bungalow’s large ‘L’ shaped lounge⁄dining room has a feature blue slate fire place and patio doors leading out onto the private south facing sun terrace. The kitchen and utility room are fully equipped including ceramic hob, double oven, microwave, fridge⁄freezer, dishwasher and washer⁄dryer. Our clean and homely holiday house comes complete with central heating for early and late season bookings and is available all year round including Christmas and the New Year, 2017 terms from £790. to £1790. Reduced rates for 4 people outside of the main season. For more information or to book your stay at Sharmalyn for your holiday in Cornwall, please contact us using the enquiry form or contact details on our Contact Us page.